Wow, what a depressing winter huh? Considering the last few posts, you would have thought that there was no hope for good birding. 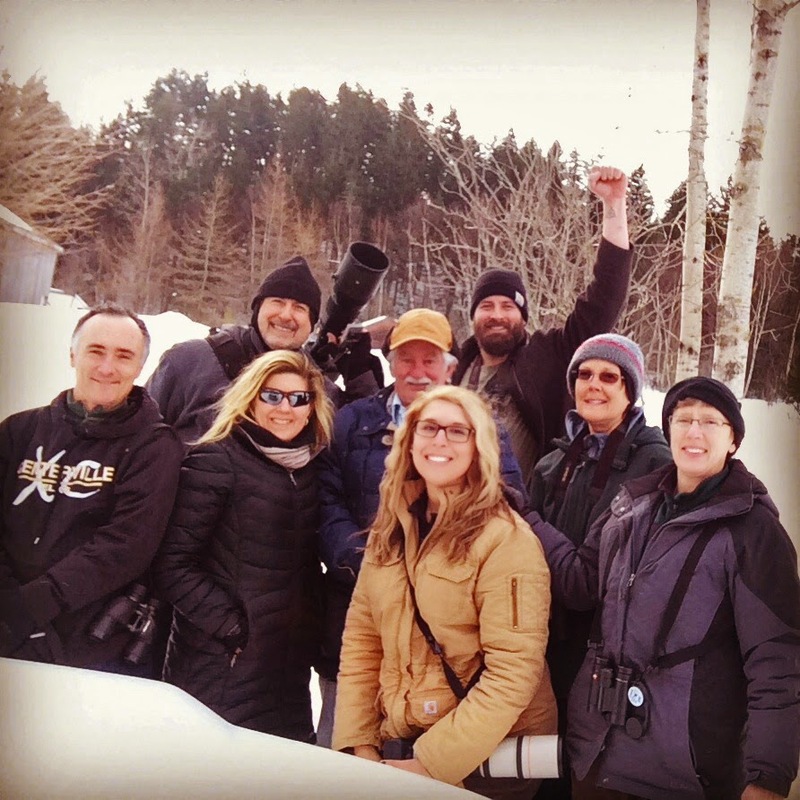 Well that changed over the weekend when I went along with a gang of other crazy birders to Nova Scotia and Prince Edward Island. You read that right.. 7 of us rented a van and DROVE to Canada for the WEEKEND to look for birds. 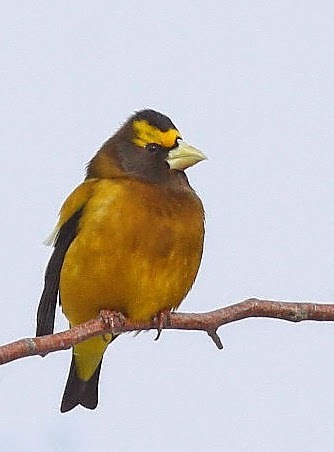 Our target birds were rare visitors from Europe that ended up in North America and others that are northern specialties. We scored big time! We left my house at 1 PM on Friday, met the rest of the group in north Jersey at 4 PM and headed north. We took turns driving and ended up in Nova Scotia at 7 AM. 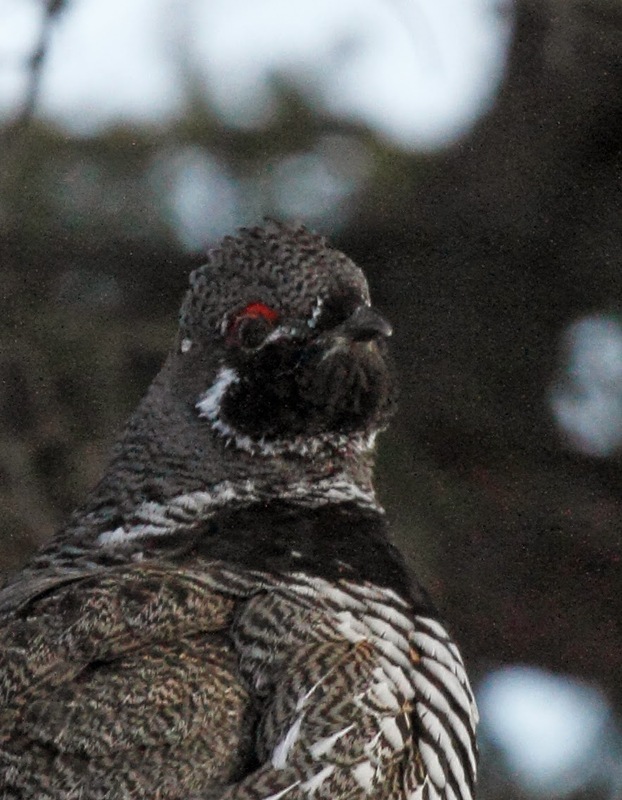 We were almost immediately rewarded with our first target bird - Spruce Grouse. This Dapper Dan was sitting next to the snow covered road like he was waiting for us to arrive. He allowed us to oooh and aaaah and snap photos for 10 minutes. We left him, not the other way around. Here is a close up of his face. Interesting to see that his chin feathers look like a beard. Off we went to a little town of Apple something in search of a European vagrant that has spent weeks in someone's yard. 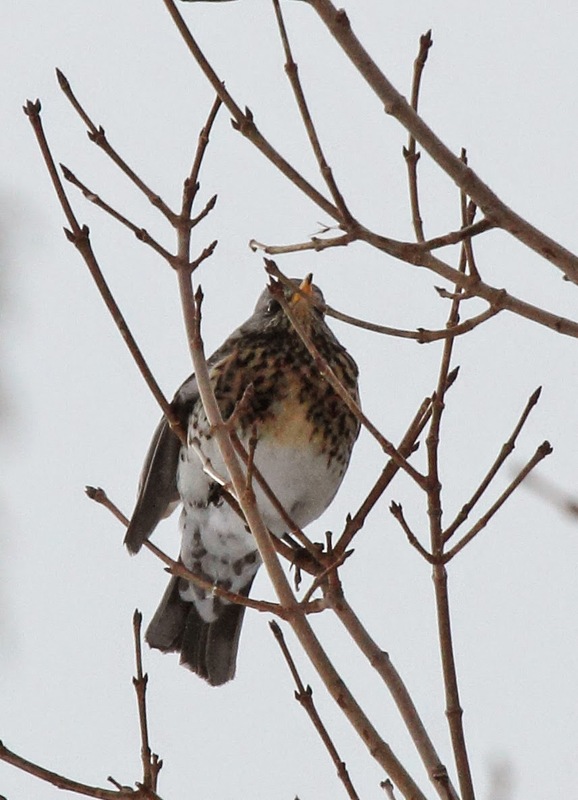 Fieldfare reminds me of our Robin but has different markings. We found the house and the bird easily. The homeowner saw the 15 passenger van pull up and came out to greet us. Nice guy. He made us sign a book. I was number 125 to view the bird. Here are numbers 118 - 125. A mottlie crew for sure. Ken and Lisa, Alyssa, me in the front. Brandon, the homeowner Blain, Larry and Deidra behind us. Fun stuff. 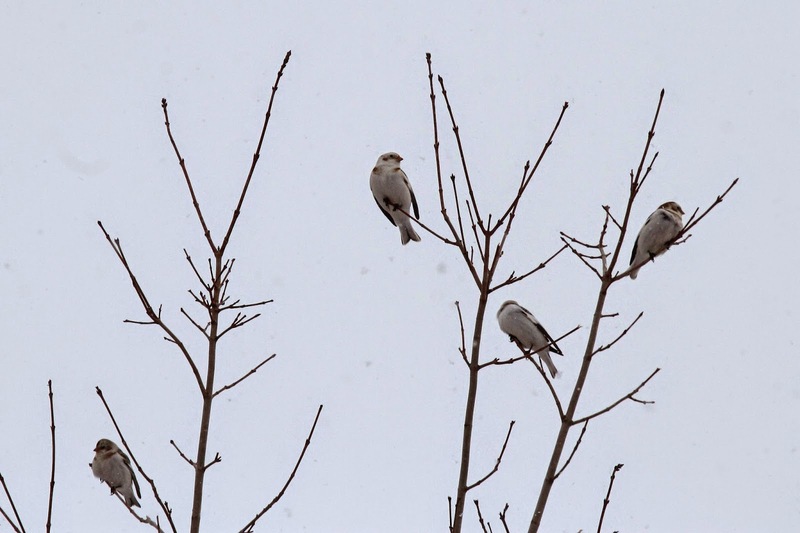 We also saw a few other favorites like these Snow Buntings which we usually see on open ground like fields or the beach. None of us can remember ever seeing them in trees like this. 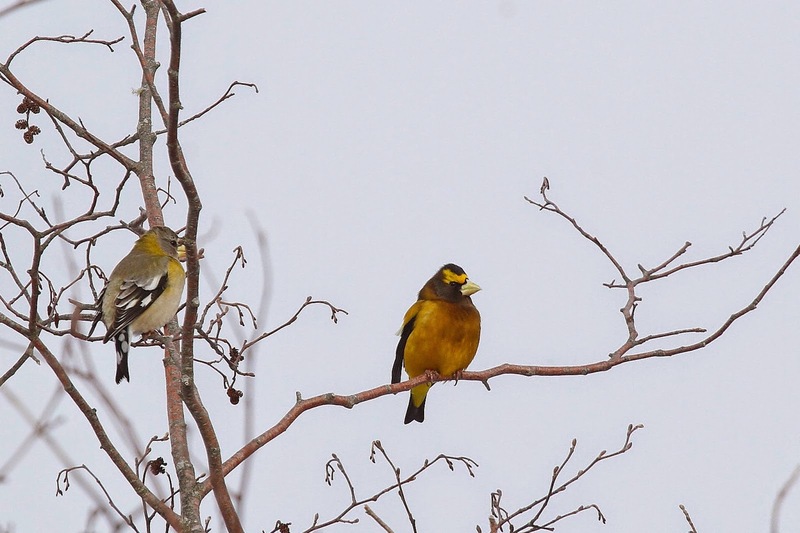 A flock of Evening Grosbeaks were also there. I cannot resist taking photos of this bird. Here is one that is cropped pretty tight. you can see that distinctive eyebrow. Here is a wider zoom. You can see the difference between male and female. It was just about lunchtime so we grabbed a sandwich and headed north past Halifax to a little golf course where a Eurasian Kestral has been hanging out. This is a small falcon that looks similar to our Kestral. I saw one in Scotland last summer. Click here to see that post. My photos from Scotland and Nova Scotia are equally pathetic. 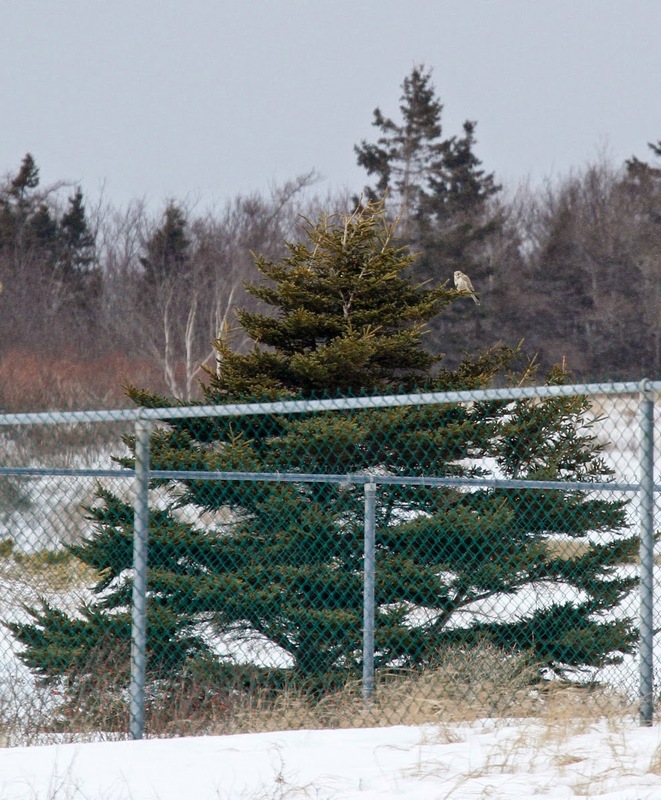 Here is the Nova Scotia bird perched in a pine tree. By the time we showed up, the wind was howling which made photos difficult. With all targets checked off of our list, we headed out to Prince Edward Island to find a nice hot meal and hotel for the night. Mind you, we had all been up for over 24 hours by this point. Signs like this were all over the highway - "Lookout for giant moose eating cars". Ee-gads. Once in PEI, we had a great meal and settled down for the night. The next morning, we headed out to find grouse but struck out on all counts. Finding grouse in any condition is tough but with 5 feet of snow on the ground it is impossible. Most of the group opted to give up much to the dismay of a few others who wanted to keep looking. I had to be at work on Monday morning, so wanted to get home as fast as possible. We had 13 hour drive ahead of us. 13 hours of hard driving straight south. Of course, birders are wired to scan trees at all times in hopes of finding something good. We do this while driving all of the time. 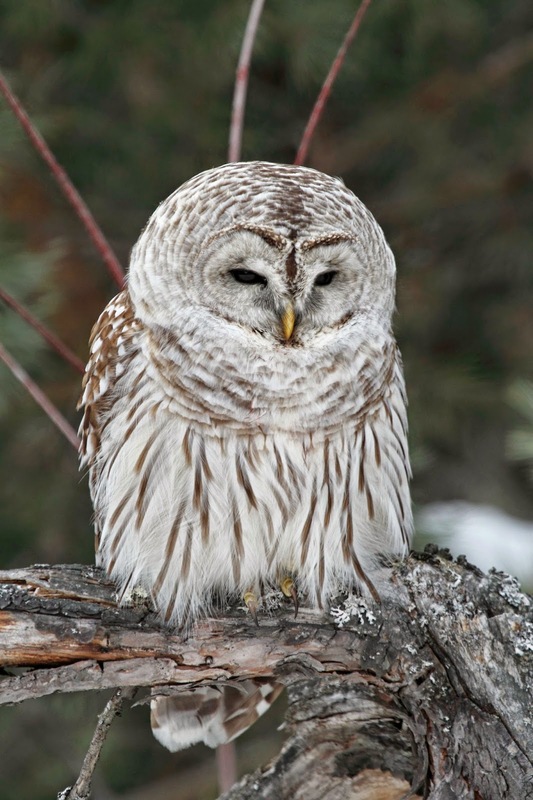 Deirdre yelled "Barred Owl!" and the van came to a screeching halt on the shoulder of I-95 in Maine. We made a few illegal u-turns and sure enough, she was right. This beauty sat there in broad daylight! This is full frame photo - no cropping. This is how close we were to the owl. Alyssa and I did a "selfie" through the van window. That capped off a great trip! Here is a map of our travel - 2000 miles in less than 3 days. Crazy! 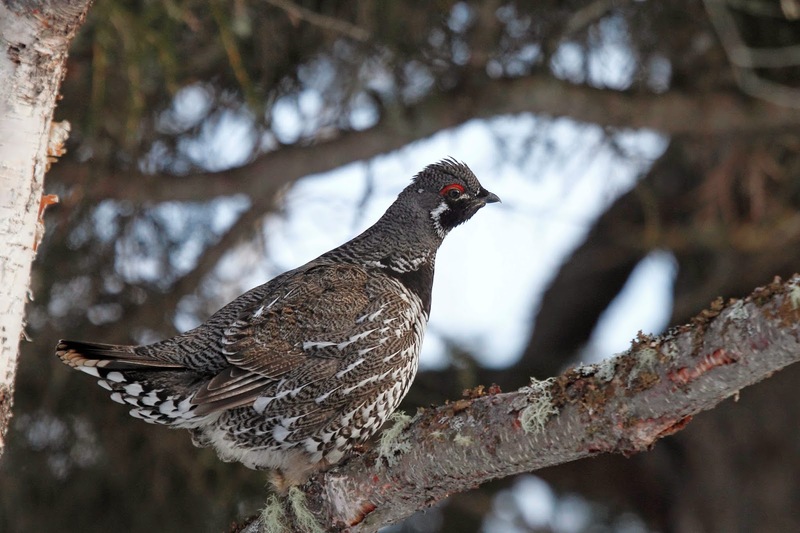 Save the first Spruce Grouse for this year's best photo contest. The detail is amazing! Do you ever get a full night sleep? Poor Roxie must miss you, not to mention Connie.....STAY HOME ONCE IN A WHILE!!! !